Louisa Catherine Johnson Adams (February 12, 1775 – May 15, 1852), wife of John Quincy Adams, was the First Lady of the United States from 1825 to 1829. Born in London, she was the first First Lady to be born outside the United States, or the preceding Thirteen Colonies—a distinction that would not be shared until 192 years later by Melania Trump. Adams was born Louisa Catherine Johnson on February 12, 1775, in London, the illegitimate daughter of Joshua Johnson, an American merchant from Maryland, whose brother Thomas Johnson later served as Governor of Maryland and United States Supreme Court Justice, and Catherine Newth, an Englishwoman, whose identity was long a mystery; her great-great-grandson Henry Adams joked that her existence was "one of the deepest mysteries of metaphysical theology." Louisa had six sisters: Ann "Nancy," Caroline, Harriet, Catherine, Elizabeth (2nd wife of Congressman John Pope (Kentucky politician)), and Adelaide, and a brother, Thomas. She grew up in London and Nantes, France, where the family took refuge during the American Revolution. Thomas Johnson was an 18th-century American judge and politician. He participated in several ventures to support the Revolutionary War. Johnson was the first (non-Colonial) governor of Maryland, a delegate to the Continental Congress, and an associate justice of the Supreme Court. Johnson suffered from a myriad of health issues. He was the first person appointed to the court after its original organization and staffing with six justices. Johnson's tenure on the Supreme Court lasted only 163 days, which makes him the shortest-serving justice in U.S. history. All Hallows-by-the-Tower, also previously dedicated to St Mary the Virgin and sometimes known as All Hallows Barking, is an ancient Anglican church on Byward Street in the City of London, overlooking the Tower of London. Her parents left Europe in 1797 and went to the U.S. When her father was forced into bankruptcy, President John Adams appointed him as U.S. Director of Stamps. Her father, who suffered from mental illness, died in Frederick, Maryland, in 1802 of severe fever, leaving little provision for his family. Her mother died in September 1811, in her mid-fifties,  and is buried in Rock Creek Cemetery. 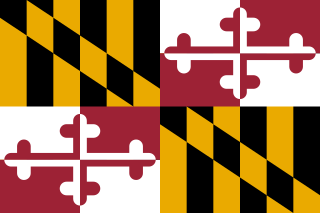 Frederick is a city in, and the county seat of, Frederick County in the U.S. state of Maryland. It is part of the Baltimore–Washington Metropolitan Area. Frederick has long been an important crossroads, located at the intersection of a major north–south Indian trail and east–west routes to the Chesapeake Bay, both at Baltimore and what became Washington, D.C. and across the Appalachian mountains to the Ohio River watershed. It is a part of the Washington-Arlington-Alexandria, DC-VA-MD-WV Metropolitan Statistical Area, which is part of a greater Washington-Baltimore-Arlington, DC-MD-VA-WV-PA Combined Statistical Area. The city's population was 65,239 people at the 2010 United States Census, making it the second-largest incorporated city in Maryland, behind Baltimore. Frederick is home to Frederick Municipal Airport, which accommodates general aviation, and to the county's largest employer U.S. Army's Fort Detrick bioscience/communications research installation. Rock Creek Cemetery is an 86-acre (350,000 m2) cemetery with a natural and rolling landscape located at Rock Creek Church Road, NW, and Webster Street, NW, off Hawaii Avenue, NE, in the Petworth neighborhood of Washington, D.C., United States. It is across the street from the historic Soldiers' Home and the Soldiers' Home Cemetery. It also is home to the InterFaith Conference of Metropolitan Washington. On August 12, 1977, Rock Creek Cemetery and the adjacent church grounds were listed on the National Register of Historic Places as Rock Creek Church Yard and Cemetery. George Washington Adams was an American attorney and politician. He was the eldest son of John Quincy Adams, the sixth President of the United States. Adams served in the Massachusetts House of Representatives and on the Boston City Council. He died of an apparent suicide at age 28. John Adams II was an American government functionary and businessman. The second son of President John Quincy Adams and Louisa Adams, he is usually called John Adams II to distinguish him from President John Adams, his famous grandfather. The Smolenskoye Cemetery is a Lutheran cemetery on Dekabristov Island in Saint Petersburg, Russia. It is one of the largest and oldest non-orthodox cemeteries in the city. Until the early 20th century it was one of the main burial grounds for ethnic Germans. Louisa was sickly, plagued by migraine headaches and frequent fainting spells. She had several miscarriages over the course of her marriage. Having grown up in London and France, she found Massachusetts dull and provincial, and referred to the Adams family home as being "like something out of Noah's Ark". Nevertheless, she developed a warm affection for her father-in-law, and despite occasional differences, a deep respect for her mother-in-law Abigail Adams, whom she later described as "the guiding planet round which we all revolved". She left her two older sons in Massachusetts for education in 1809 when she took two-year-old Charles Francis Adams to Russia, where Adams served as a Minister. Despite the glamour of the tsar's court, she had to struggle with cold winters, strange customs, limited funds, and poor health. An infant daughter born in 1811 died the next year. Louisa Adams' successor Pat Nixon acquired a portrait of the First Lady that now hangs in the White House. Peace negotiations called Adams to Ghent in 1814 and then to London. To join him, she made a forty-day journey across war-ravaged Europe by coach in winter. Roving bands of stragglers and highwaymen filled her with "unspeakable terrors" for her son. The next two years gave her an interlude of family life in the country of her birth. When John Quincy Adams was appointed James Monroe's Secretary of State in 1817, the family moved to Washington, D.C. where Louisa's drawing room became a center for the diplomatic corps and other notables. Music enhanced her Tuesday evenings at home, and theater parties contributed to her reputation as an outstanding hostess. The pleasures of moving into the White House in 1825 were dimmed by the bitter politics of the election, paired with her deep depression. Though she continued her weekly "drawing rooms", she preferred quiet evenings of reading, composing music and verse, and playing her harp. As First Lady, she became reclusive and depressed. For a time, she regretted ever having married into the Adams family, the men of which she found cold and insensitive. The necessary entertainments were always elegant and her cordial hospitality made the last official reception a gracious occasion although her husband had lost his bid for re-election and partisan feeling still ran high. She thought she was retiring to Massachusetts permanently, but in 1831 her husband began seventeen years of service in the United States House of Representatives. The untimely deaths of her two oldest sons added to her burdens. "Our union has not been without its trials," John Quincy Adams conceded. He acknowledged many "differences of sentiment, of tastes, and of opinions in regard to domestic economy, and to the education of children between us." But added that "she always has been a faithful and affectionate wife, and a careful, tender, indulgent, and watchful mother to our children." Her husband died at the United States Capitol in 1848. She remained in Washington until her death of a heart attack on May 15, 1852, at the age of 77. The day of her funeral was the first time both houses of the United States Congress adjourned in mourning for any woman. She is entombed at her husband's side, along with her parents-in-law President John Adams and first lady Abigail Adams, in the United First Parish Church in Quincy, Massachusetts. The First Spouse Program under the Presidential $1 Coin Act authorizes the United States Mint to issue 1/2-ounce $10 gold coins and medal duplicates  to honor the first spouses of the United States. Louisa Adams' coin was released May 29, 2008. Martha Washington was the wife of George Washington, the first President of the United States. Although the title was not coined until after her death, Martha Washington served as the inaugural First Lady of the United States. During her lifetime she was often referred to as "Lady Washington". Charles Francis Adams Sr. was an American historical editor, writer, politician, and diplomat. He was a son of President John Quincy Adams and grandson of President John Adams, about whom he wrote a major biography. 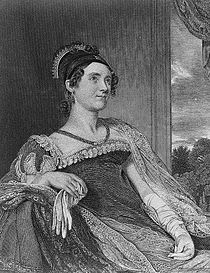 Elizabeth Kortright Monroe was the First Lady of the United States from 1817 to 1825, as the wife of James Monroe, President of the United States. Due to the fragile condition of Elizabeth's health, many of the duties of official White House hostess were assumed by her eldest daughter, Eliza Monroe Hay. John Quincy Adams II was an American lawyer, politician, and member of the Adams political family. Abigail "Nabby" AmeliaAdams Smith was the daughter of Abigail and John Adams, founding father and second President of the United States, and the sister of John Quincy Adams, sixth President of the United States. She was named for her mother. John Adams is a 2008 American television miniseries chronicling most of U.S. President John Adams's political life and his role in the founding of the United States. Paul Giamatti portrays John Adams. The miniseries was directed by Tom Hooper. Kirk Ellis wrote the screenplay based on the book John Adams by David McCullough. The biopic of John Adams and the story of the first 50 years of the United States was broadcast in seven parts by HBO between March 16 and April 20, 2008. John Adams received widespread critical acclaim and many prestigious awards. The show won four Golden Globe awards and 13 Emmy awards, more than any other miniseries in history. 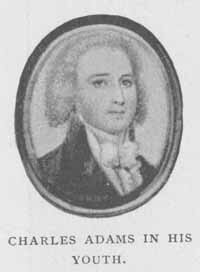 Charles Adams was the second son of President John Adams and his wife, Abigail Adams. Thomas Boylston Adams was the third and youngest son of the 2nd president of the United States, John and Abigail (Smith) Adams. The Quincy family was a prominent political family in Massachusetts from the mid-17th century through to the early 20th century. It is connected to the Adams family through Abigail Adams. ↑ "Louisa Adams – First Ladies". HISTORY.com. Retrieved 2016-04-16. ↑ "First Lady Louisa Adams". C‑SPAN. March 18, 2013. Retrieved March 25, 2013. ↑ U.S. Mint: First Spouse Program. Accessed June 27, 2008. "The United States Mint also produces and make available to the public bronze medal duplicates of the First Spouse Gold Coins." Heffron, Margery M. Louisa Catherine: The Other Mrs. Adams (Yale University Press, 2014) x, 416 pp. Wikimedia Commons has media related to Louisa Adams .